The cottages are located on a small cereal farm. 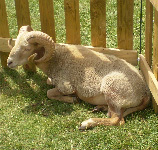 While you are staying with us and if we can plan it, we will be pleased to show you our farm animals ! Some are free to wonder about in the common garden of the three guest houses, but most of them are enclosed in the farm. Acces to the farm is only authorized with accompany of one of us. Want to see more of it ? Visit our mobile farm website ! DilouOur 4 years old beuceron is happy to welcome you and spends her time playing with all the farm animals ! BichetteBorn in april 2002, this donkey is our mascot ! We have other donkeys to. CaramelOur Dexter cow, the world's smallest cow race ! MoustiqueThe oldest of our goats... and by the way.... the boss !! MielouOur sheep lives with his wife, baby and friends in the field ! HensWe have a collection of hens of different colors and sizes that definitely brighten the farmyard ! RabbitsHere is Panpan and Noirot !